“What is this?” Asked people all over Twitter when a wave of identical news items swept the world, from the Philippines and China to Australia and France. Is there trouble in paradise? Is the Dutch cycling utopia really a utopia in the sense that it is a non-existing phantasy? 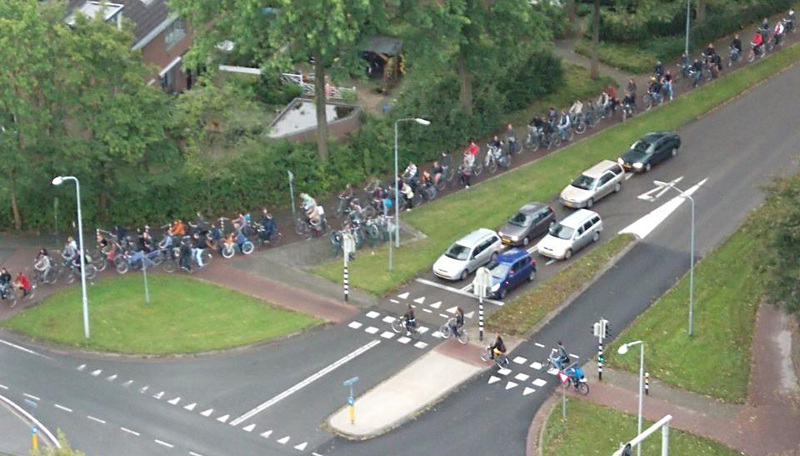 Student bicycle traffic jam in Wageningen NL, courtesy Paul van den Akker. Is the cycle path too narrow or is the green phase for cyclists too short? The latter is easily remedied. So where does this all come from? 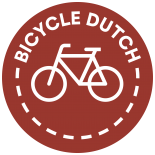 It may surprise you, but the source of the quotes is the Dutch Cyclists’ Union. So what is this all about? The Cyclists’ Union has several tasks, some of which are almost contradictory. On the one hand they need to promote cycling by telling everybody how great it is to cycle. It is fun and safe! On the other hand they need to focus on things that are not (yet) good enough (even in the Netherlands) and lobby for improvements. In recent years cycling in the Netherlands grew in an unexpected pace. Investments in infrastructure, both for the riding bike as well as for parking your bicycle did not keep up with this pace, at least not everywhere. At some times of the day in certain areas with a lot of cycling the paths have therefore become too crowded. I have shown you examples of that in the past. People cycling in such areas have to lower their speed and they may sometimes even have to wait twice for the light to get green before they can cross a junction. The situation has unfortunately also led to more injuries. Secondly it has become apparent that there is no adequate bicycle parking space anymore in city centers and near the central railway stations of the larger cities. As I have also shown you before, especially Utrecht and Amsterdam experience both these phenomenons. Some municipalities in the Netherlands have to be made (more) aware of that, but there are signs the message is coming across. In one of their latest transport policy plans, released in September 2012, Utrecht proclaims the bicycle ‘the primary means of transport in the city’ in one of the seven policy principles. Amsterdam has also announced a big investment plan to catch up and to get the cycling infrastructure up to standards. With the help of all the experts working together the rest of the Netherlands will follow these examples, I am sure. The challenges the Dutch municipalities face will be tackled. There is more than enough room for the bicycle in the Netherlands. Sometimes the message seems too far-fetched. In a recent article in their magazine the Cyclists’ Union quotes an investigation that claims to know who causes the bicycle traffic jams: “In cities such as Utrecht, Amsterdam and ‘s-Hertogenbosch the traditional workers have left. The mobile, highly educated couples with a double income have taken their place. This group needs the bicycle for their way of life. [They] change their workplace so often, that they look for a central place from which both can easily reach many cities. The highly skilled double income couples use a centrally located city as a ‘base camp’ from which they use the bicycle in combination with the train to ‘swarm’ the country looking for interesting jobs and projects.” I must say, this explanation for the busy cycle traffic does not convince me at all. Coincidentally I spend most of my time in those three cities, so I can easily give you an idea of what the situation is there. That means I have three videos for you this week. One from Monday morning rush hour in ‘s-Hertogenbosch, one from the middle of the day in Utrecht and one showing the beginning of evening rush hour in Amsterdam. What these video’s show you is that it is indeed very busy on the cycle paths, at some places at some times of the day, but it is far from hell on earth and the Dutch are already working on a solution. Monday morning rush hour in ‘s-Hertogenbosch (November 12, 2012 8:00am). Busy streets but calm behavior of all road users. These are mostly children riding to school. Certainly no “double income couples”. Wednesday afternoon in Utrecht (November 14, 2012 2:00pm). Busy streets but once the light gets green all the waiting cyclists can pass the junction. In morning and evening rush hour that can be different. This junction is clearly not constructed well enough for cyclists. Very busy cycle paths near Amsterdam central station on a Friday afternoon (Sept. 30, 2011 4:00pm). Cycling here could improve a lot if one or more of the car lanes would be used for cyclists and pedestrians. There sure are a lot fewer people in cars who benefit from all that space than there are pedestrians and cyclists. It is challenges like these, the Dutch face at the moment. Has anyone here even tried the singles in Israel? Pingback: Let's bike it! » Не всё так гладко и в раю? As an engineer in Cambridge (UK), I am delighted to see so many people commuting by bike. However, it also saddens me that cyclists seem to disregard pedestrians – your videos show people hesitating to cross at zebra crossings due to the volume. This happens in Cambridge too. Additionally, I noticed a bus was delayed for quite a while by a long string of cyclists. I agree that the junctions probably need more design consideration, but it would appear that sheer volume of any particular form of transport brings out the worst of human nature. ie. selfishness. Perhaps buses could be fitted with transponders which change traffic lights as they approach, as here in Cambridge. It would seem sensible to allow any vehicle carrying the most people to have priority, assuming they’re not polluting. That may encourage a switch to electric-powered buses. Transport is a thorny issue and I am really grateful for your blog and videos which encourage the discussion and hopefully the eventual ideal compromise. Regards. Zebra crossings on bike paths with high volumes are usually fitted with traffic lights. In the middle of a group of cyclists, it’s hard to stop for crossing pedestrians without prior warning (orange light for a few seconds), without causing additional danger for the ones behind you. Buses are quite often fitted with transponders, but ‘most people’ shouldn’t get priority by default. On a bus trip of 10 minutes, 3 stops for some cyclists are far less inconvenient than 3 large groups of cyclists having to stop (usually without a safe and proper space) for a bus. If you want to encourage cycling, you should make their trips as comfortable as possible. The more cyclists, the more difficult that becomes. Just like you should avoid traffic lights on a multi lane highway, you should avoid them on high-volume bike paths. Thank you for such wonderfully informative site. As a novice bike rider, who is quickly being drawn to bike travel opportunities around the world, I found this site very informative, as it answered many of my questions, and prepared me for all my future adventure bike trips that are sure to be made easier through the details you provided. Thanks again. When I look at the top picture I can’t stop comparing the amount of space allocated to 6 cars, perhaps with 6 to 12 people inside them, to the tiny lane given to a caravan of 40 or 50 cyclists. Maybe now is the time for the Dutch cyclists to “invade” the roads. What do you think? Hey! Hey! What’s with all the ‘death to people on scooters’? Only the slow ones, the only ones that one is allowed to ride without a helmet, are allowed on bikepaths. Do you want to throw the young girls and old age pensioners (90 percent of those on the ‘slow’ scooter) between cars, buses and trucks? Yeah, sure, there are a few 16 yo boys who enjoy to take those scooters and revv them up until they are annoyingly fast (and LOUD! ), but they enjoy flitting between cars and buses almost as much as your average Vehicular Cyclist, so what’s the problem? They’re not riding a bicycle, like YOU? Don’t you lot think you’re sounding an eetsy bitsy like those idiotic car-owners in The Sun, ranting about Those Cyclists That Are Such A Nuisance, Why Don’t They Just Drive A Car Like The Rest Of Us? Small potato, the menacing people on scooters were all significantly younger than I am. I’m not quite a senior, but I’m in my 50s. Of course it depends on where one lives or stays in the Netherlands, but in working-class East Amsterdam, most of them were teenage boys or young men. Not many seniors or girls on scooters. I was, however, happy to see Muslim girls and young women cycling (on bicycles) in various forms of hijab. I’m secular and not a fan of any religion, but I was very happy to see them enjoying the freedom of cycling in the clothing they chose. The ‘slow’ scooters don’t need to be revved up. They are the same vehicle as the ordinary, ‘fast’ scooter, but with a limiter chip built in. This chip will be removed by almost every scooter store if you ask them to. 96% of all ‘slow’ scooters go too fast. Their average speed is 34 kph, even though the legal limit is 25 kph. Scooter owners cause 15% of all accidents, even though they only make up 1.5% of the road users. This is why people want them off the bike path. Would someone falling off a scooter at 25 km/h benefit from a helmet any more than a helmet would benefit a Dutch cyclist riding at 25 km/h? Speaking as a sometimes journalist who happens to be very interested in cycling issues, I can say my biggest problem with this blog post was that it did not “name and shame” the news organisations and reporters who were responsible for these badly researched news articles, or give examples of the more egregious bits of misrepresentation. Perhaps even by providing contact information, these people could have been shown just how badly wrong they got it. As I already suspected (KNEW), the ‘cycling hell’ story was likely written by someone very similiar to the American Republican Party, who has proven over the last year that outrageous lies for an agenda are perfectly acceptable tactics. One of the blogs on cycling in the Netherlands – forget whether it was this one, A View from the Cycle Path, Amsterdamize, or more than one of you – detailed the method used to remove bicycles that had been parked and abandoned at the major railway stations, which was a major factor in the parking problem. I saw such notices at Muiderpoort station (East Amsterdam) this summer; I got the impression that action has been taken to solve this problem. I saw NO bicycle traffic jams in Amsterdam – in June, which should be high season – summer weather but before most people go on holiday – more significant than the daily ones we have during rush hour at the most important north-south bicycle path here in Montréal. Yes, bicycles should get still more room, and above all, block the bromfietsen! Bikeboy, I believe you, but do you have evidence of that? I agree about the bromfietsen – I found their presence very intimidating when last on a bicycle path, in Amsterdam. A clearer distinction must be drawn between too-heavy bromfietsen and electric assist bicycles – which should look like other bicycles and only have an assist, for elderly or disabled cyclists. I see a lot of healthy-looking, rather aggressive young men on the bromfietsen. I had to defend cycling in the Netherlands recently because of this bizarre attack by foreign media- paid for by Ford perhaps?! The answer lies in the picture in the beginning of post, and in the last paragraph. There is too much public space allocated to inefficient vehicles like cars, and that causes congestion, although the situation is definitely not as bad as in rest of the world. If you think about it, this applies more or less equally to the dilemma faced by the principal cycling campaign groups here in the UK, the LCC and in particular the CTC. Of course they want more people to cycle, so they downplay the risks – perhaps too much so, but aiming to paralyse people with fear isn’t necessarily smart either. Fantastic post, Mark. Thank you for clearing up the mess that the Western media made of the story. The distorted reporting is how locals can justify inaction. I’ve been reading these articles with surprise at how eager some foreign newspaper jump to the conclusion that ‘bicycles don’t work’ as easily as you sketch here. So I’m glad you’ve taken the time to bring back in the nuance. I’ve been looking on the internet for articles on designing cities around the bicycle, but these are far and few between. That leaves me with the distinct impression that the most that is done, even here in the Netherlands, is patching up. Time for an integral approach, AND time to get rid of these annoying slow scooters. Just one class of mopeds, 45 km per hour, helmeted, and if you don’t want to wear a motorcycle helmet, take the electric bicycle. It is probably true to say that the Netherlands would have a major motor vehicle congestion problem if only a small fraction of the five million (daily?) bike rides were instead made in space-hogging cars. Yes 5 million bike journeys is per day. I’ve added that in the text. How sad is it that those 5 million bike journeys per day are more than all in the USA! Thanks for being the voice of reason again, Mark. If Sydney could develop an overcrowded bike path problem, we’d be very happy. I find the worst bike parking shortages in Amsterdam are at Centraal Station (of course), and around the Noordermarkt on a Saturday. But the worst that ever happens is that I have to chain the bike to a fence or bridge away from the crush and walk a block or two. Not much of an imposition, really. This entry was posted on 22 November 2012 by Bicycle Dutch in Original posts and tagged Amsterdam, ’s-Hertogenbosch (Den Bosch), Cyclists' Union (Fietsersbond), NL is not perfect, Utrecht.